Tonight’s recipe is pure FUN! Just a quick update! I’m still in Spain! Well – actually, I think when you read this I’ll be in Portugal. I’m walking the El Camino de Santiago. It’s a pilgrimage along the coast of Spain and Portugal. I’m walking it with my mom in thanksgiving for the healing she’s received from her stroke! Anywho – I’m posting video blogs over on my YouTube channel, as well as posting fun photos from the trail on my Instagram: @beauty.beyond.bones – so be sure to follow along! 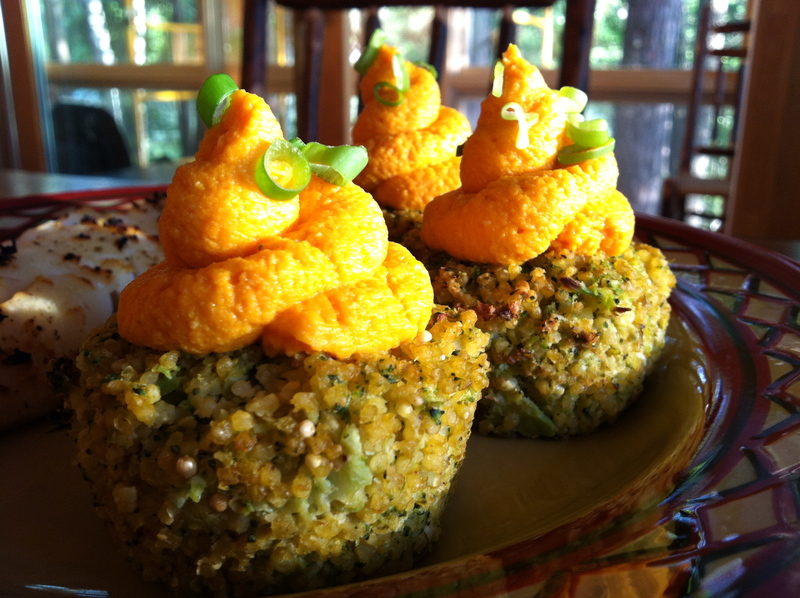 Sometimes, things aren’t what they seem…Like this “cupcake!” It’s actually made of veggies!!! But don’t let that scare you. It’s merely a fun presentation of a delicious combination of ingredients! They were so whimsical and fun! And absolutely delicious. And they’re gluten free and paleo with a vegan option! Now, you may be scratching you head at one of these ingredients: millet. I mean….isn’t that literally bird seed? Millet is a highly nutritious, gluten-free whole grain that is widely used around the world as a cereal staple. It is very similar to quinoa in its make up, and can be compared in taste and texture to couscous! Plus, it is a terrific source of fiber, magnesium, and antioxidants. And like all my recipes, if you prefer, you can sub either quinoa or brown rice for the millet! Cook the millet until it absorbs all the liquid – about 25 minutes. Then, fluff it with a fork and spread it out on a plate to cool. In the meantime, steam the broccoli until it is barely tender. (It will finish cooking in the oven). Shock it under ice-cold water, drain it, and pat dry. Transfer it to a medium-sized bowl, and add your egg white, almond flour, garlic, green onions, salt (about 1/2 – 1 tsp), and pepper. Then rise out your food processor – you will use it again. After your millet has cooled slightly, add it to the broccoli mixture and mix well to combine. Scoop 1/4 cup of the mixture into a nonstick muffin tin that’s been sprayed really well with olive-oil spray. (Or use muffin liners.) Really pack the mixture into each cup. Mist the tops with olive oil, and then bake for 30-35 minutes, until the tops are golden brown! Steam you carrots until they are tender, about 5 minutes. Shock them under ice-cold water, drain and pat dry. Then, puree in the food processor with the cashews and about 1/2 tsp salt and several cracks of black pepper. Puree until smooth and creamy! Let the cupcakes cool, and then carefully take them out of the pan. Do this by putting a plate upside-down over the muffins, and then in one circular motion, flip the muffins onto the plate. They should fall right out! To assemble: Put the “frosting” into a ziplock bag, and squeeze it down to one corner. Then, snip off the corner with scissors, and you will have made a bakeshop pastry bag! Then you can pipe the frosting onto your cupcakes! Garnish with thinly sliced green onion. My oh my, what a treat! Let me tell you – I made these for my family, and there is such drama when you bring them to the table and present them. Because they are so BEAUTIFUL! There were “oohs” and “aahs” around the table when they see those whimsical orange swirls. I mean, come on – you can’t look at these and not smile. But they’re not just easy on the eyes. They taste phenomenal. The millet cooked in vegetable stock provides this wonderfully savory canvas that is brought to life by the garlic and green onion. The broccoli, which has been pulverized, blends right in and is barely detectable, other than adding a beautifully earthy note. And then the carrot puree on top is the perfect compliment. It is creamy and rich from the cashews, which provide this magnificent buttery flavor. I honestly couldn’t get enough! And lastly – the texture is amazing. The millet “pops” in your mouth. And the creamy carrot topping blends it all together. This is a superstar meal for sure. One that you can be proud to serve at a dinner party, or even a holiday meal! Next Post El Camino Videos! This sounds like something I can make to trick my picky eater into eating veggies! Way cool. I walked/ biked the El Camino de Santiago when I was in high school. Such a life-changing experience. Enjoy it and praying for such revelation for you two. Wow! yes, I thought that was quinoa for sure. I have not tried millet as yet or at least as far as I know.😆 They look delicious and a nice variation​s to the traditional American muffin. As a veggi I would like to try out your recipe. I love broccoli too. 🤔 making vegetables look like dessert. Very intrigued, makes my plate look happier! 🙃 great post! Sounds innovative ! Just cant wait to try !! How interesting. I need to try this. Will share with my Son the Chef. I have to admit it’s scary but I’ve been wrong before. I’m game. thank you friend! hahah I absolutely love carrots, but you could sub mashed sweet potato! Those are the MOST beautiful cupcakes I’ve ever seen in my life! And I love broccoli, it tastes so good! 😀 thank you much for sharing! Blessings! Haven’t eaten anything like this. Can’t wait to try it out at home. Thanks! Thanks! They’re a fun dinner for sure!